Ankylosing Spondylitis Symptoms Quiz - Could It Be AS? COULD IT BE ANKYLOSING SPONDYLITIS? Find out if you could be painfully wrong about your chronic back pain. It may be caused by an inflammatory condition like ankylosing spondylitis. Take this 5-question quiz. 1 Did back pain and stiffness start before your 40th birthday? 2 Did symptoms appear gradually over time? 3 Do you feel better after exercise? 4 Has the pain lasted longer than 3 months? 5 Does your back feel stiff when you wake up? Did you take this quiz for yourself? Based on your answers, it looks like your back pain may not be inflammatory. That makes it less likely you have a disease like ankylosing spondylitis. It’s still important to talk to your doctor to understand what is causing your back pain. 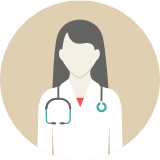 Your doctor may recommend that you see a specialist to diagnose and manage your symptoms. Based on your answers, it looks like your back pain may be inflammatory. There are several causes of inflammatory back pain. For some people, it’s caused by ankylosing spondylitis. Talk to your doctor to determine if you should see a rheumatologist—a specialist qualified in the diagnosis and management of inflammatory conditions like AS. The results of your Symptom Quiz have been sent to the email address you provided. Please note: The results of the quiz are meant to help you determine if the symptoms you are experiencing are similar to those of inflammatory back pain. This quiz is not meant to diagnose patients with inflammatory back pain or diseases associated with inflammatory back pain such as AS. If you are experiencing back pain, you should talk with your doctor. 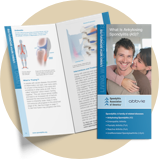 Receive a free brochure with valuable, actionable information about ankylosing spondylitis daily living, treatment, and support.